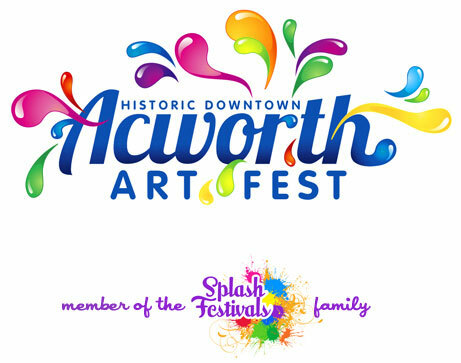 The Acworth Art Fest is a two day celebration of whimsical and vibrant art in the springtime! This year’s event will take place on April 6 & 7 in the historic district on Main Street in downtown. Acworth is a delightful backdrop for over 100 whimsical and talented artisans from around the country. Their creative booth displays decorate our charming streets with paintings, pottery, metalwork, folk art, glass, jewelry, yard art and much more! At the Acworth Art Fest, the always energetic Kidz Zone is filled with fun activities that make smiles bloom. This vibrant play land is the exhilarating place to be for young people and their happy parents. Of course, there is wonderful food from Acworth’s own eateries, and shoppers will also find delectable treats in the food court to satisfy their taste buds. The City’s art scene is growing, downtown shops and galleries are hopping, and the Acworth Art Fest is the sweet cherry on top of our delicious and enchanting community! For more information please visit www.splashfestivals.com.